HONOLULU (AP) — Hawaii transportation officials were assessing an unstable slope above a busy highway on Oahu Tuesday after a landslide on the roadway sent three people to the hospital. The Pali Highway, which connects Honolulu and the east side of the island over a steep mountain range, was completely closed Tuesday. Portions of it will remain shut down all week after multiple landslides covered the roadway in two spots on Monday, Hawaii Department of Transportation spokesman Tim Sakahara said. The Honolulu-bound lanes remained open. 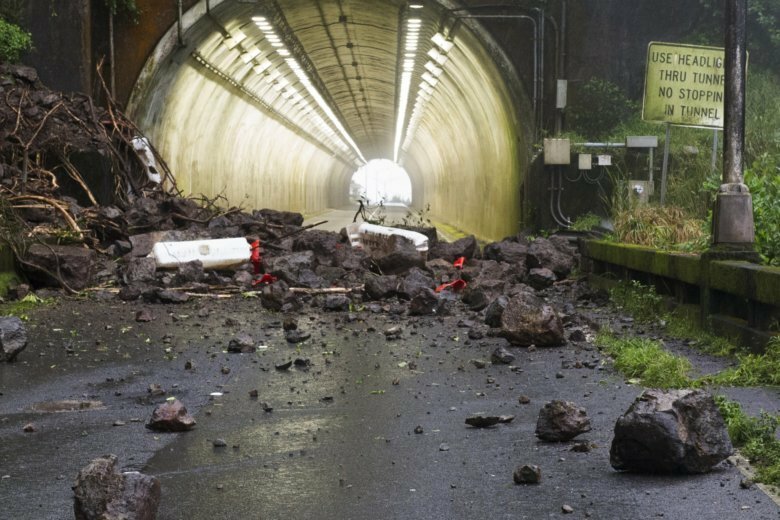 But about an hour later, another landslide struck nearby, sending huge rocks and debris crashing onto the open lanes where a pickup truck was passing into a tunnel. The Honolulu-bound lanes of the highway, where the vehicle was hit, will remain closed until at least Monday, Sakahara said. He said there are several large boulders, some as big as a vehicle, that are still at risk of falling. Crews will need to secure the hillside before clearing debris on the road and reopening the highway. Pieces of concrete from Old Pali Road, the original route from Honolulu to the windward side of Oahu, also came down with the slide. Officials said in a statement that the road had significant cracks and damage that need to be secured. The highway was closed in both directions as officials inspected the hillside. But the road was cleared and reopened before the afternoon commute.